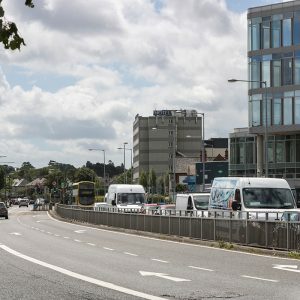 In 2016, Dalata Hotel Group, the largest hotel operator in Ireland completed the purchase of the Tara Towers hotel on the Merrion Road, Dublin for €13.2 million. Dalata have seen massive growth in the past couple of years, now with a combined portfolio of 38 hotels with over 7,500 rooms. 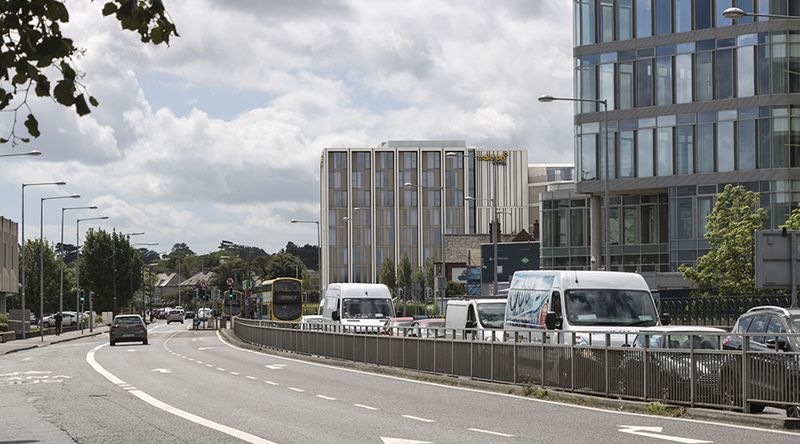 Dalata successfully operates Ireland’s two largest hotel brands, Clayton Hotels and Maldron Hotels across Ireland and the UK, as well as managing a small portfolio of partner properties. In December 2017, planning was granted for the re-development of the hotel. 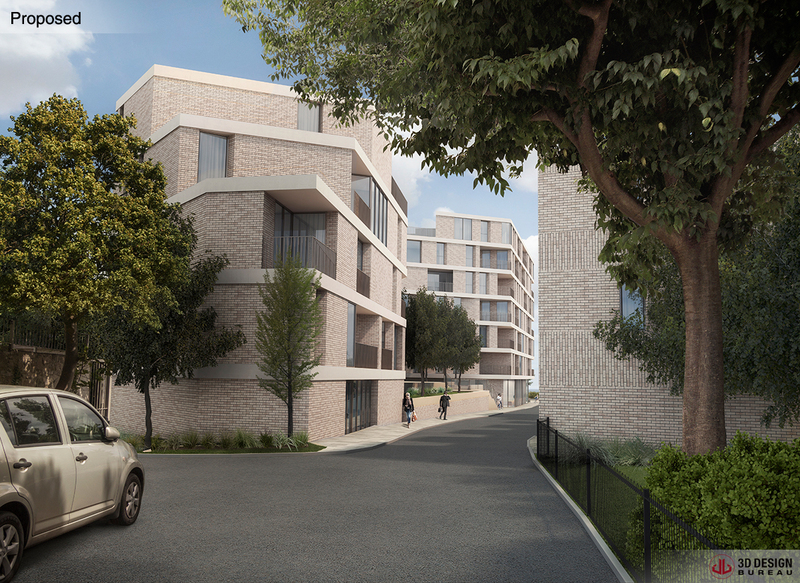 #Team3DDB produced a series of Verified View Montages for this scheme, all of which were used to secure planning. 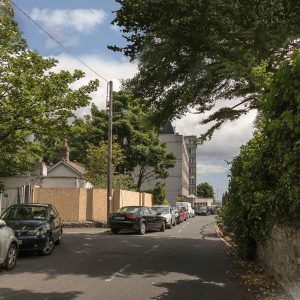 The proposed development of the hotel site comprises the demolition of all existing buildings and structures on site and the construction of a new mixed-use building that ranges in height between 1 and 9-storey over basement level to provide a replacement hotel of approximately 6,634.7 sq.m of hotel (140 bedrooms) fronting onto Merrion Road, together with 57 no. residential units (comprising 9 x 1 bedroom; 38 x 2 bedroom and 10 x 3 bedroom units comprising) at first to 6th floor level, to the side (south) and rear (west) of the hotel block fronting Bellevue Avenue. Proposed roof terraces serving the residential units at 1st to 8th floor (rooftop) levels. 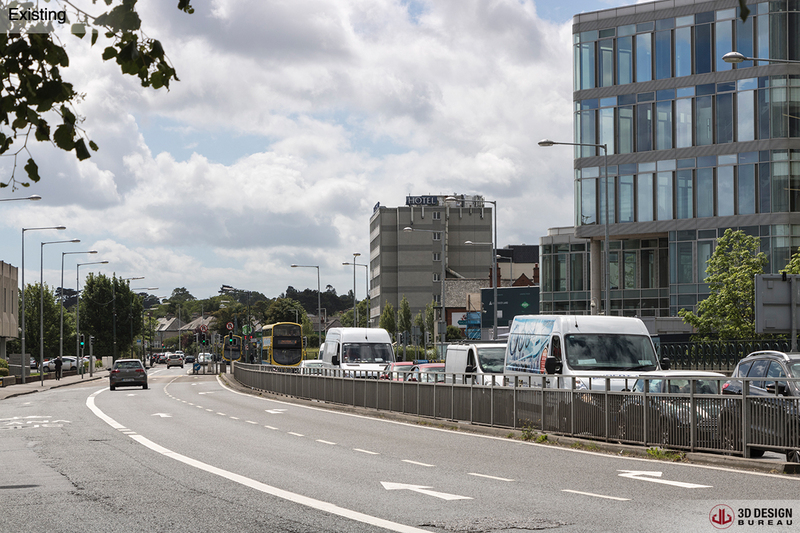 The basement and ground level car park provides 138 car parking spaces, 76 bicycle parking spaces together with ancillary plant, storage and waste storage areas with ESB sub-station and switch room at ground floor level. A new ramped vehicular access/ egress is provided off Bellevue Avenue serving the ground and basement level car park. The existing vehicular access off Bellevue Avenue close to the junction with Merrion Road shall be retained to provide a secondary vehicular access/ egress for passenger service vehicles and delivery vehicles. 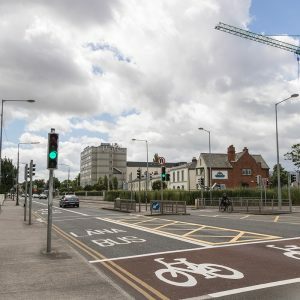 The existing vehicular access onto Merrion Road shall be closed and a new gate-controlled vehicular egress point onto Merrion Road at the north-eastern corner of the site is proposed for such servicing vehicles. 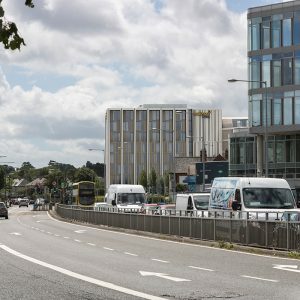 The proposed development on the car park site comprises site clearance works and the construction of a new pocket park (public open space) of approximately 177 sq.m at the western end of the site with frontage onto Bellevue Avenue. To the east thereof is a terraced row of 5 no. 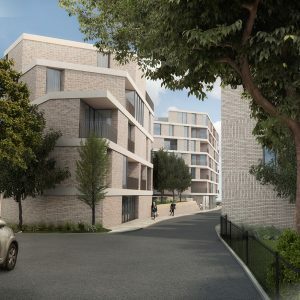 3-bedroom, part single, part 2-, part 3-storey town houses with integrated single garages, accessed of the southern side of Bellevue Avenue with ancillary private roof terraces at 2nd floor level. 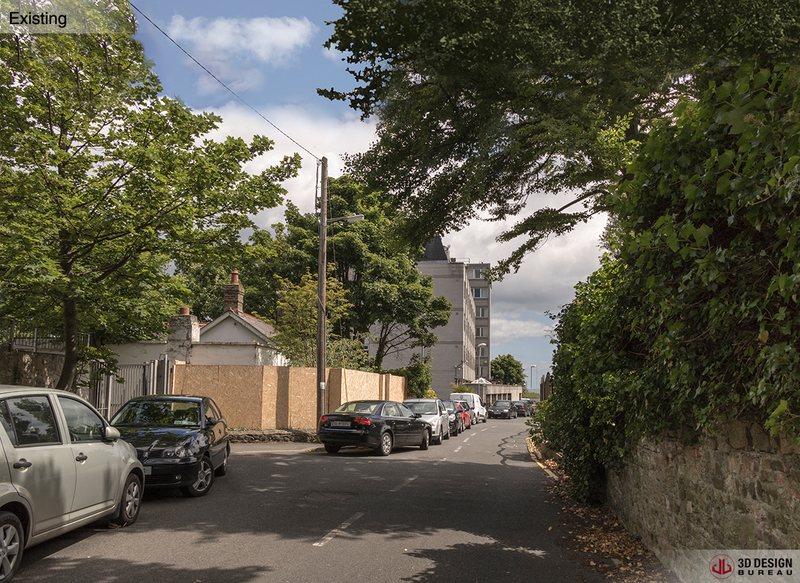 Attached to the town houses at the eastern end of the site is a proposed 4-storey apartment block comprising of 8 no. apartments (5 x 1 bed units and 3 x 2 bed units) with balconies at 1st, 2nd and 3rd floor levels to the front and rear of the block. A total of 8 no. ancillary cycle storage spaces are provided at ground level within the communal amenity space to the rear of the block at ground level. A combination of hard and soft landscaping measures are proposed to the communal and ancillary amenity spaces and areas of public realm. 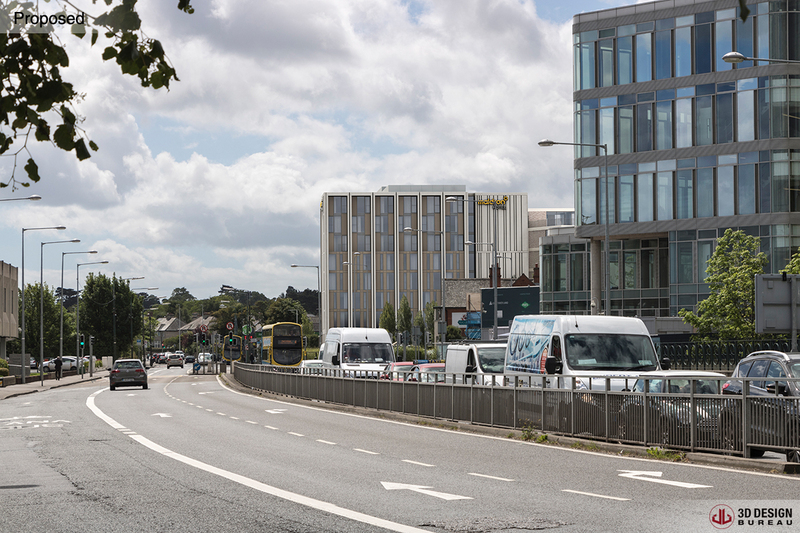 Developer: Dalata Hotel Group – Dalata is Ireland’s largest hotel operator, with a current portfolio of 38 hotels (owned, leased and managed). They successfully operate the Maldron Hotel brand and Clayton Hotel brand throughout Ireland & the UK, as well as managing a portfolio of Partner Hotels. Architect: MOLA Architecture – provides a diverse range of architectural services ranging from Urban Design, Masterplanning, Education, Health Care, Hospitality, Civic, Cultural, Residential, Interiors, Infrastructural and Mixed Use Developments. 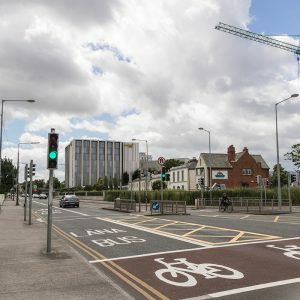 Planning Consultant: Declan Brassil and Company – is one of Ireland’s leading Planning Consultancy Practices. 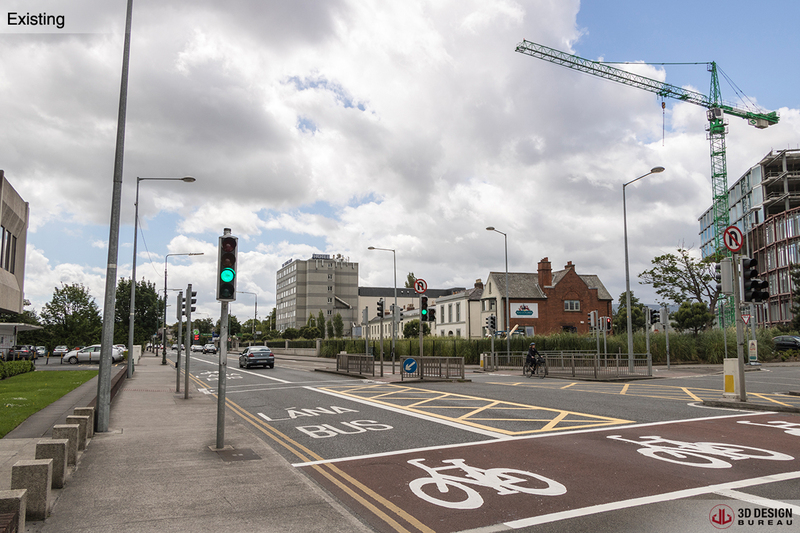 The Practice has extensive knowledge and experience of the Irish Planning System, providing expert planning services to public bodies and private sector clients. Landscape Consultant: AIT Urbanism & Landscape – Landscape Architecture & Urban Design Practice based in Dublin. They view their work as the design and delivery of habitat for human beings with a core ethos of pursuing this agenda and seeking to find the best fit solutions for people. CGI Consultants: 3D Design Bureau – are specialists in Architectural Visualisation, BIM and VR – Delivering Quality Design Planning and Marketing Solutions. For this project, the team created a series of Verified View Montages and Architectural Renderings, all of which are being used in the planning process. If you have a project requiring Verified View Montages, or any of our deliverables, please get in touch. You can contact us by phone or email and talk to us about your requirements and the solutions best suited to your project. +35312880186 info@3ddesignbureau.com. You can also check out the rest of work online.